Abstract: Up to 20% of depressed patients demonstrate treatment resistance to one or more adequate antidepressant trials, resulting in a disproportionately high burden of illness. Ketamine is a non-barbiturate, rapid-acting general anesthetic that has been increasingly studied in treatment resistant depression (TRD), typically at sub-anesthetic doses (0.5 mg/kg over 40 min by intravenous infusion). More recent data suggest that ketamine may improve response rates to electroconvulsive therapy (ECT) when used as an adjunct, but also as a sole agent. In the ECT setting, a dose of 0.8 mg/kg or greater of ketamine demonstrates improved reduction in depressive symptoms than lower doses; however, inconsistency and significant heterogeneity among studies exists. Clinical predictors of responses to ketamine have been suggested in terms of non-ECT settings. Ketamine does increase seizure duration in ECT, which is attenuated when concomitant barbiturate anesthetics are used. However, most studies are small, with considerable heterogeneity of the sample population and variance in dosing strategies of ketamine, ECT, and concomitant medications, and lack a placebo control, which limits interpretation. Psychotomimetic and cardiovascular adverse effects are reported with ketamine. Cardiovascular adverse effects are particularly relevant when ketamine is used in an ECT setting. Adverse effects may be mitigated with concurrent propofol; however, this adds complexity and cost compared to standard anesthesia. Long-term adverse effects are still unknown, but relevant, given recent class concerns for anesthetic and sedative agents. The objectives of this review are to summarize the extant literature to identify: (1) differences in efficacy that may exist between different doses of ketamine when used alone or with various concomitant agents in an ECT setting; (2) the efficacy of doses other than 0.5 mg/kg, with or without concomitant agents, and through different routes of administration, in a non-ECT setting; and (3) clinical predictors of response to ketamine in both settings. The following databases were searched: Pubmed, Embase, PsycINFO (1987 to present), and MEDLINE (1946 to present). The following search terms were used: ketamine, N-methyl D-aspartate, NMDA antagonist, ECT, electroconvulsive therapy, electroshock therapy, major depressive disorder, major depression, MDD, treatment-resistant depressive disorder. Studies were included if they met the following criteria: language, English; publication status, published trials; design, RCT; intervention, ketamine administration alone without ECT for treatment of MDD, ketamine administration with other agents without ECT for treatment of MDD, ketamine administration as an anesthetic for ECT for treatment of MDD, ketamine administration as an anesthetic for ECT along with other agents for treatment of MDD; participants, diagnosis of MDD, TRD, psychotic TRD, bipolar depression. Studies were excluded if they met the following criteria: (1) Studies of ketamine use in a non-ECT setting using 0.5 mg/kg iv infusion over 40 min, unless investigating clinical predictors for response or use in combination with other specified agents for treatment of TRD; (2) cross-over studies – due to the potential of carry-over effects; (3) studies that did not investigate ketamine as a treatment of depression; and (4) studies that did not report the efficacy of ketamine as one of the primary objectives. The level of evidence for each study was assessed using prespecified criteria6 (Table 1). The search generated 704 results, of which 26 studies met the inclusion criteria. Ten additional resources were used for background information purposes. Two additional studies were included from the bibliographies of relevant studies. 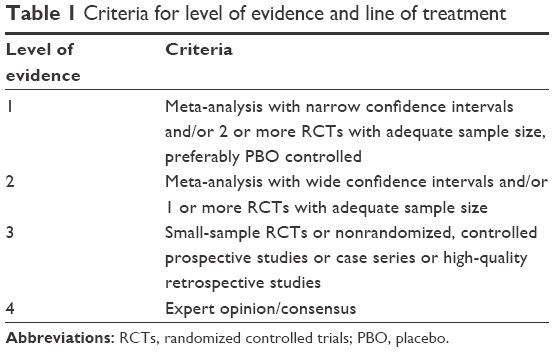 Abbreviations: RCTs, randomized controlled trials; PBO, placebo. Abbreviations: iv, intravenous; ECT, electroconvulsive therapy; TRD, treatment resistant depression; MADRS, Montgomery-Asberg Depression Rating Scale; RCT, randomized controlled trial; NS, normal saline; MDD, major depressive disorder; HDRS, Hamilton Depression Rating Scale; MMSE, Mini Mental State Examination; BPD, bipolar disorder; SK, sevoflurane-ketamine; SS, sevoflurane-saline; DB, double-blind; EEG, electroencephalogram; MAP, mean arterial pressure; BL, baseline; bpm, beats per minute; BD, bipolar depression; MC, multi-center; CAS, Clinical Anxiety Scale; CGI-S, Clinical Global Impression-Severity; CGI-I, Clinical Global Impression-Improvement; QIDS-SR, Quick Inventory of Depressive Symptomatology-Self Report; EQ-5D-3L, third-level version of the EuroQol five-dimensional questionnaire; HAM-A, Hamilton Anxiety Scale; PHQ, Patient Health Questionnaire; HADS, Hospital Anxiety and Depression Scale; PBO, placebo. When compared to control anesthesia, ketamine alone, or as an adjunctive agent to other anesthetics, significantly reduced depression severity in a number of studies.7,8,10,14,18 Some studies have also shown an increased seizure duration if ketamine was used as a sole anesthetic, or in combination with other anesthetics, when compared to ketamine-free anesthesia.9,10,21 Significant cognitive improvement was also seen with ketamine, especially in patients with higher cognitive impairment at baseline.10 Several studies showed a more rapid response to ECT in patients receiving ketamine, despite the overall end effect being non-significant.10,13 When considering dose-related efficacy, a majority of studies demonstrated efficacy with ketamine doses equal to or greater than 0.8 mg/kg, which may provide a signal for interpretation. One study, however, did not find a significant improvement in depressive symptoms when a dose of 2 mg/kg was used. Given the significant heterogeneity of studies, as well as a lack of high quality studies, conclusive results around dose-related efficacy were not possible. At best, this could be considered as a guide for future research. In contrast, a few RCTs have not found ketamine to be superior to other anesthetics in depressive symptom reduction or improved cognition,15–17,19,20 even if the seizure duration was prolonged with ketamine.11 The effect of ketamine on seizure duration varied between studies, with some demonstrating no difference between ketamine and controls.20 Of note, most of the studies employed different methods of ECT administration, such as dose titration,11 which could explain some of the observed differences in treatment efficacy. Abbreviations: iv, intravenous; ECT, electroconvulsive therapy; MDD, major depressive disorder; HDRS, Hamilton Depression Rating Scale; RCT, randomized controlled trial; TRD, treatment resistant depression; MADRS, Montgomery-Asberg Depression Rating Scale; BD, bipolar depression; SUD, substance use disorder; DB, double-blind; po, per os; NS, normal saline; BPRS, Brief Psychiatric Rating Scale; CGI-I, Clinical Global Impression-Improvement; PBO, placebo. Lenze et al23 attempted to demonstrate the efficacy and safety of prolonged ketamine infusion (0.6 mg/kg/h over 96 h) vs a single dose (0.5 mg/kg for 40 min), both with co-administration of clonidine (0.3 mg twice daily) in patients with TRD. Although there was no difference in Montgomery-Asberg Depression Rating Scale (MADRS) scores between prolonged infusion and a single dose of ketamine, a more sustained antidepressant response (spearman correlation coefficient between S-ketamine concentration and MADRS change from baseline: 0.75 for 96-hour arm and 0.17 for 40-minute arm; p<0.05) was observed at 8 weeks following prolonged infusion. Li et al24 compared single bolus ketamine at doses of 0.5 mg/kg and 0.2 mg/kg, and a single bolus of normal saline in patients with TRD. The investigators found no significant difference between the two ketamine treatment strategies, but both treatments were significantly more effective than placebo (PBO) (Hamilton Depression Rating Scale [HDRS] reduction of 37.8%, 38.2%, and 26.7%, respectively). Abbreviations: ECT, electroconvulsive therapy; iv, intravenous; TRD, treatment resistant depression; MDD, major depressive disorder; MADRS, Montgomery-Asberg Depression Rating Scale; DB, double-blind; RCT, randomized controlled trial; PBO, placebo; HAM-D, Hamilton Depression Rating Scale; BDI, Beck Depression Inventory; HAM-A, Hamilton Anxiety Scale; BPRS, Brief Psychiatric Rating Scale; CADSS, Clinician Administered Dissociative States Scale; YMRS, Young Mania Rating Scale; SSI, Scale for Suicidal Ideation; IDS, Inventory of Depressive Symptomatology; QIDS-SR, Quick Inventory of Depressive Symptomatology-Self Report; CGI-I, Clinical Global Impression-Improvement; po, per os; NS, normal saline; HDRS, Hamilton Depression Rating Scale. Riluzole is a glutamatergic modulator postulated to induce a rapid response to ketamine, and to maintain remission without the potential psychotomimetic side effects associated with ketamine.25 When dosed at 50 mg twice daily for 4 weeks following a single ketamine infusion (0.5 mg/kg) in patients with TRD, riluzole did not appear to significantly prolong the duration of response (time to relapse=17.2 days for riluzole; 9.8 days for PBO). However, the study was not adequately powered to show a difference between the two treatment groups. In another RCT, riluzole was administered at a daily dose of 100–200 mg following a ketamine infusion (0.5 mg/kg).26 There was no significant difference in time-to-relapse with riluzole, when compared to PBO (24.4 days and 22.0 days, respectively). A combination of single iv dose of ketamine (0.5 mg/kg) and escitalopram (10 mg daily) was studied in patients with severe MDD.27 Compared to escitalopram therapy alone, the combination group had a significantly higher response rate (92.3% vs 57.1%), remission rate (76.9% vs 14.3%), shorter time to response (HR=0.04 95% CI=0.01–0.22), and remission (HR=0.11, 95% CI=0.02–0.63). Oral ketamine has been investigated as an antidepressant treatment in patients with mild-to-moderate depression and concomitant chronic pain (Table 5).28 When compared to diclofenac, ketamine, dosed at 50 mg orally three times a day, showed significant improvement in HDRS (mean difference=2.85, 95% CI 0.54–5.16) and Hospital Anxiety and Depression Scale (HADS) scores (mean difference=0.75, 95% CI 0.18–1.32) at week 6 of treatment. Abbreviations: po, per os; MDD, major depressive disorder; HDRS, Hamilton Depression Rating Scale; ECT, electroconvulsive therapy; HADS, Hospital Anxiety and Depression Scale; DB, double-blind; RCT, randomized controlled trial. A recently conducted study compared three different doses of S-(+)-ketamine enantiomer (esketamine) (28 mg, 54 mg, and 84 mg) administered intranasally vs PBO, and found that all three doses significantly decreased MADRS in both phases of the studies.29 However, in patients with severe MDD and at imminent risk of suicide, intranasal esketamine (84 mg), along with standard of care, was shown to be superior to PBO in reducing symptoms of depression.30 These two studies are summarized in Table 6. Abbreviations: TRD, treatment resistant depression; IDS, Inventory of Depressive Symptomatology; BD, bipolar depression; ID, intellectual disability; PD, personality disorder; PTSD, post-traumatic stress disorder; OCD, obsessive compulsive disorder; ECT, electroconvulsive therapy; MADRS, Montgomery-Asberg Depression Rating Scale; DB, double-blind; MC, multi-center; RCT, randomized controlled trial; PBO, placebo; OL, open-label; BL, baseline; TEAE, treatment-emergent adverse event; CADSS, Clinician Administered Dissociative States Scale; PL, placebo; MDD, major depressive disorder; BPD, bipolar disorder; SUD, substance use disorder; CGJ-SR, Clinical Global Judgment of Suicide Risk. In contrast to most anesthetic agents that are typically hypotensive, ketamine increases heart rate and blood pressure via centrally mediated adrenergic response; and, while this may be useful in trauma or shock situations, the parasympathetic and sympathetic responses to ECT result in transient hypotension and bradycardia followed by hypertension and tachycardia. Ketamine anesthesia is, thus, associated with temporary increases in pulse rate and blood pressure (BP), with a median systolic and diastolic peak increase of 20%–25% from baseline. (2) Studies have reported a significant QTc interval prolongation (up to 20.7 ms) and an increase in mean arterial BP (range of 9.8–22.5 mmHg).8,10,12,13,19,21 This may be clinically significant, considering that many psychotropics (antidepressants, antipsychotics, lithium) prolong QTc interval. Abbreviations: FHP, family history positive; AUD, alcohol use disorder; TRD, treatment resistant depression; MADRS, Montgomery-Asberg Depression Rating Scale; FHN, family history negative; HDRS, Hamilton Depression Rating Scale; RCT, randomized controlled trial; PBO, placebo; BDI, Beck Depression Inventory; SSI, Scale for Suicidal Ideation; YMRS, Young Mania Rating Scale; IDS, Inventory of Depressive Symptomatology; DB, double-blind; iv, intravenous. Safety concerns in the setting of ECT include higher rates of hypertension, QTc interval prolongation, transient arrhythmias, confusion, or fear, with hallucinations upon awakening from anesthesia.7–9,12,16,23,25 The rates of these effects appear to have a positive correlation with an increasing dose of ketamine, notably in the 0.8–2.0 mg/kg dosing range.8,9,12,16,23,25 Ketamine use in patients with cardiovascular disease should be considered with caution, especially when used in an ECT setting. Ketamine should also be considered with caution in patients with a history of psychotic episodes, due to its potential psychotomimetic effects. Concomitant use of propofol may be considered to mitigate some of these adverse effects.8 However, this does add to complexity and cost. It is important to note that most of these adverse effects are transient in nature, and subside shortly after completion of an ECT session.7,15,18 Therefore, an individual risk–benefit analysis should be considered. The studies investigating the clinical predictors of ketamine’s efficacy in TRD are indeed interesting.33 The evidence to date suggests that ketamine may potentially be more beneficial for patients with a history of a first-degree relative with alcohol dependence, patients suffering from anxious depression, patients with slower processing speed at baseline, patients suffering from depression and undergoing a surgery, and patients who are around 50 years of age.26,34–36 It is important to note that, currently, such evidence may only be interpreted as signals, and further research is needed to better understand the clinical predictors of ketamine’s efficacy in TRD. There are a few limitations to this literature review. A full meta-analysis was not performed, and only published English language studies were included. The average level of evidence was 3; many studies were at high risk for bias, given the lack of blinding, and the majority had less than 50 participants. Small samples are underpowered to conclude a meaningful difference between treatment groups. Additionally, the populations included in these studies were heterogeneous and included patients with differing durations of illness and on different antidepressant treatments. Ketamine has been principally investigated in patients with chronic and severe depression who may have altered neurobiology and pharmacological responses, when compared to patients who are relatively early into their illness.38,39 Therefore, the results cannot be generalized to all patients suffering from MDD, and it is important to recognize that even small changes in depressive symptoms may be more meaningful or accepted in a population of patients with very treatment-resistant depression. Studies also differed in ECT administration techniques and depression rating scales used. 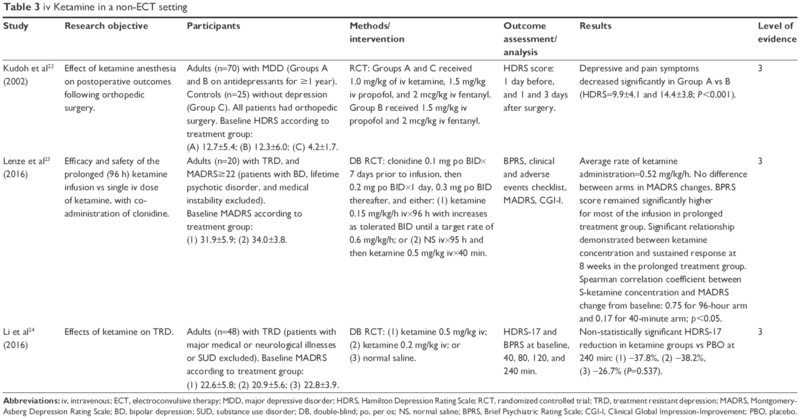 There are only limited data regarding validity of depression rating scales used more frequently than weekly, whereas changes in ketamine response may occur on an hourly to daily basis.26 Some studies have also used PBO controls, but ketamine’s psychotomimetic effects render full blinding difficult.23,24,29,30 The majority of the studies allowed concomitant medications, which increases inter-patient variability, and exacerbates potential risk for specific interactions with ketamine. Finally, only short-term effects of ketamine have been explored, thus leaving the question of long-term safety unanswered. This is particularly relevant given the recent class warning for anesthetic and sedative agents. Ketamine warrants consideration as an agent for use in an ECT setting and may accelerate response. However, the evidence is mixed, the effect is modest at best, and many questions regarding optimal dosing strategies remain unanswered. The long-term safety of ketamine is still unknown, and there are recent class concerns with respect to the use of most anesthetic agents. Ketamine may be more efficacious in patients with certain clinical predictors, but requires further investigation to confirm the same. It should be used with caution or avoided in certain patients with additional risk factors for cardiovascular or psychotomimetic adverse effects. Additional rigorous, well-controlled, randomized, double-blinded studies are needed that would further explore different dosing strategies and routes of administration for ketamine in ECT and non-ECT settings, in order to address risks and benefits. Dr Adam Abba-Aji FRCPC, Program Director, Mood and Anxiety Disorders Program, University of Alberta, is gratefully thanked for his review of the manuscript. VJ, CN, and JC have no conflicts of interest to report in this work. PC has received research grants and honoraria from Janssen, Pfizer, Eli Lilly, Astra Zeneca, Glaxo Smith Kline, Lundbeck, Bristol Myers Squibb, Hoffmann la Roche, Sunovion, Mylan, Paladin, Boehringer Ingelheim, Otsuka, HLS, Allergan, and Novartis. Mrazek DA, Hornberger JC, Altar CA, Degtiar I. A review of the clinical, economic, and societal burden of treatment-resistant depression: 1996–2013. Psychiatr Serv. 2014;65(8):977–987. Inc SC. Product Monograph. QC, Canada: Sandoz Canada Inc.; 2015. Available from: https://www.sandoz.ca/sites/www.sandoz.ca/files/Ketamine_HCl_PMe_20150506.pdf. Accessed July 13, 2017. Naughton M, Clarke G, O’Leary OF, Cryan JF, Dinan TG. 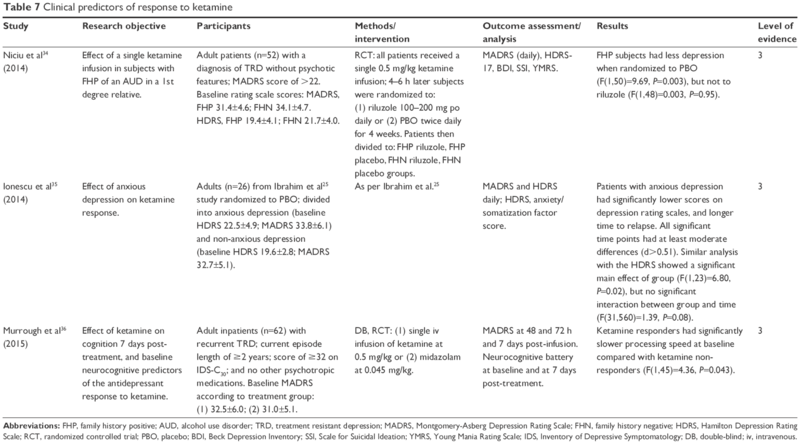 A review of ketamine in affective disorders: current evidence of clinical efficacy, limitations of use and pre-clinical evidence on proposed mechanisms of action. J Affect Disord. 2014;156:24–35. Newport DJ, Carpenter LL, McDonald WM, et al. Ketamine and other NMDA antagonists: early clinical trials and possible mechanisms in depression. Am J Psychiatry. 2015;172(10):950–966. Sanacora G, Frye MA, McDonald W, et al. A consensus statement on the use of ketamine in the treatment of mood disorders. JAMA Psychiatry. 2017;74(4):399–405. Jarventausta K, Chrapek W, Kampman O, et al. Effects of S-ketamine as an anesthetic adjuvant to propofol on treatment response to electroconvulsive therapy in treatment-resistant depression: a randomized pilot study. J ECT. 2013;29(3):158–161. Wang X, Chen Y, Zhou X, Liu F, Zhang T, Zhang C. Effects of propofol and ketamine as combined anesthesia for electroconvulsive therapy in patients with depressive disorder. J ECT. 2012;28(2):128–132. Yalcin S, Aydogan H, Selek S, et al. Ketofol in electroconvulsive therapy anesthesia: two stones for one bird. J Anesth. 2012;26(4):562–567. Yoosefi A, Sepehri AS, Kargar M, et al. Comparing effects of ketamine and thiopental administration during electroconvulsive therapy in patients with major depressive disorder: a randomized, double-blind study. J ECT. 2014;30(1):15–21. Abdallah CG, Fasula M, Kelmendi B, Sanacora G, Ostroff R. Rapid antidepressant effect of ketamine in the electroconvulsive therapy setting. J ECT. 2012;28(3):157–161. Erdil F, Ozgul U, Colak C, Cumurcu B, Durmus M. Effect of the addition of ketamine to sevoflurane anesthesia on seizure duration in electroconvulsive therapy. J ECT. 2015;31(3):182–185. Salehi B, Mohammadbeigi A, Kamali AR, Taheri-Nejad MR, Moshiri I. Impact comparison of ketamine and sodium thiopental on anesthesia during electroconvulsive therapy in major depression patients with drug-resistant; a double-blind randomized clinical trial. Ann Card Anaesth. 2015;18(4):486–490. Rybakowski JK, Bodnar A, Krzywotulski M, et al. Ketamine anesthesia, efficacy of electroconvulsive therapy, and cognitive functions in treatment-resistant depression. J ECT. 2016;32(3):164–168. Anderson IM, Blamire A, Branton T, et al. Randomised controlled trial of ketamine augmentation of electroconvulsive therapy to improve neuropsychological and clinical outcomes in depression (Ketamine-ECT study). Efficacy Mech Eval. 2017;4(2). Kuscu OO, Karacaer F, Biricik E, Gulec E, Tamam L, Gunes Y. Effect of ketamine, thiopental and ketamine-thiopental combination during electroconvulsive therapy for depression. Turk J Anaesthesiol Reanim. 2015;43(5):313–317. Fernie G, Currie J, Perrin JS, et al. Ketamine as the anaesthetic for electroconvulsive therapy: the KANECT randomised controlled trial. Br J Psychiatry. 2017;210(6):422–428. Zhong X, He H, Zhang C, et al. Mood and neuropsychological effects of different doses of ketamine in electroconvulsive therapy for treatment-resistant depression. J Affect Disord. 2016;201:124–130. Rasmussen KG, Kung S, Lapid MI, et al. A randomized comparison of ketamine versus methohexital anesthesia in electroconvulsive therapy. Psychiatry Res. 2014;215(2):362–365. Loo CK, Katalinic N, Garfield JB, Sainsbury K, Hadzi-Pavlovic D, Mac-Pherson R. Neuropsychological and mood effects of ketamine in electroconvulsive therapy: a randomised controlled trial. J Affect Disord. 2012;142(1–3):233–240. Erdil F, Begec Z, Kayhan GE, Yologlu S, Ersoy MO, Durmus M. Effects of sevoflurane or ketamine on the QTc interval during electroconvulsive therapy. J Anesth. 2015;29(2):180–185. Kudoh A, Takahira Y, Katagai H, Takazawa T. Small-dose ketamine improves the postoperative state of depressed patients. Anesth Analg. 2002;95(1):114–118. Lenze EJ, Farber NB, Kharasch E, et al. Ninety-six hour ketamine infusion with co-administered clonidine for treatment-resistant depression: A pilot randomised controlled trial. World J Biol Psychiatry. 2016;17(3):230–238. Li CT, Chen MH, Lin WC, et al. The effects of low-dose ketamine on the prefrontal cortex and amygdala in treatment-resistant depression: a randomized controlled study. Hum Brain Mapp. 2016;37(3):1080–1090. Ibrahim L, Diazgranados N, Franco-Chaves J, et al. Course of improvement in depressive symptoms to a single intravenous infusion of ketamine vs add-on riluzole: results from a 4-week, double-blind, placebo-controlled study. Neuropsychopharmacology. 2012;37(6):1526–1533. Mathew SJ, Murrough JW, aan het Rot M, Collins KA, Reich DL, Charney DS. Riluzole for relapse prevention following intravenous ketamine in treatment-resistant depression: a pilot randomized, placebo-controlled continuation trial. Int J Neuropsychopharmacol. 2010;13(1):71–82. Hu YD, Xiang YT, Fang JX, et al. Single i.v. ketamine augmentation of newly initiated escitalopram for major depression: results from a randomized, placebo-controlled 4-week study. Psychol Med. 2016;46(3):623–635. Jafarinia M, Afarideh M, Tafakhori A, et al. Efficacy and safety of oral ketamine versus diclofenac to alleviate mild to moderate depression in chronic pain patients: a double-blind, randomized, controlled trial. J Affect Disord. 2016;204:1–8. Daly EJ, Singh JB, Fedgchin M, et al. 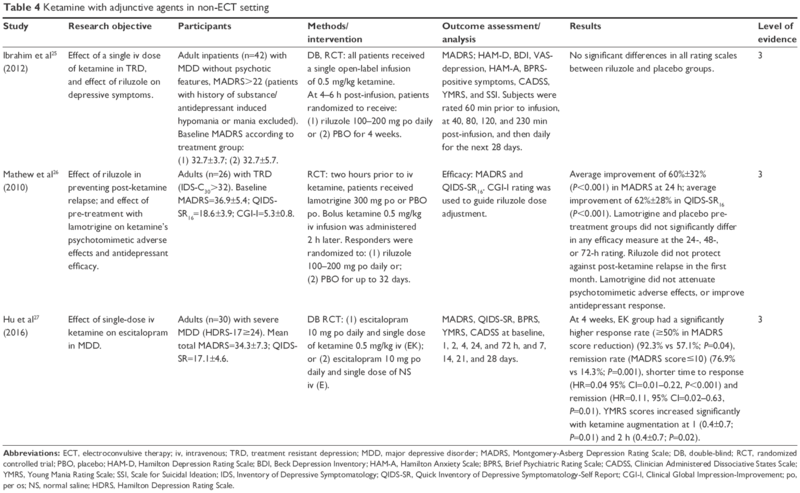 Intranasal esketamine in treatment resistant depression – a double-blind, randomized, efficacy and dose response study. Society of Biological Psychiatry’s (SOBP) 71st Annual Meeting; May 12–14, 2016; Atlanta, GA, USA. Canuso C, Singh J, Fedgchin M, et al. A novel study design to evaluate the rapid reduction of the symptoms of major depressive disorder, including suicidal ideation, in subjects assessed to be at imminent risk for suicide. Neuropsychopharmacology. 2015;40(22):S480. Zanos P, Gould TD. Intracellular signaling pathways involved in (S)- and (R)-ketamine antidepressant actions. Biol Psychiatry. 2018;83(1):2–4. FDA Drug Safety Communication. FDA review results in new warnings about using general anesthetics and sedation drugs in young children and pregnant women issued on December 14, 2016. Safety Announcement [4-27-2017]. 2017. Available from: https://www.fda.gov/downloads/Drugs/DrugSafety/UCM554644.pdf. Accessed September 1, 2017. Niciu MJ, Luckenbaugh DA, Ionescu DF, et al. Clinical predictors of ketamine response in treatment-resistant major depression. J Clin Psychiatry. 2014;75(5):e417–e423. Niciu MJ, Luckenbaugh DA, Ionescu DF, et al. Ketamine’s antidepressant efficacy is extended for at least four weeks in subjects with a family history of an alcohol use disorder. Int J Neuropsychopharmacol. 2014;18(1):pii. Ionescu DF, Luckenbaugh DA, Niciu MJ, et al. Effect of baseline anxious depression on initial and sustained antidepressant response to ketamine. J Clin Psychiatry. 2014;75(9):e932–e938. Murrough JW, Burdick KE, Levitch CF, et al. Neurocognitive effects of ketamine and association with antidepressant response in individuals with treatment-resistant depression: a randomized controlled trial. Neuropsychopharmacology. 2015;40(5):1084–1090. Sun L, Li Q, Li Q, et al. Chronic ketamine exposure induces permanent impairment of brain functions in adolescent cynomolgus monkeys. Addict Biol. 2014;19(2):185–194. Fournier JC, DeRubeis RJ, Hollon SD, et al. 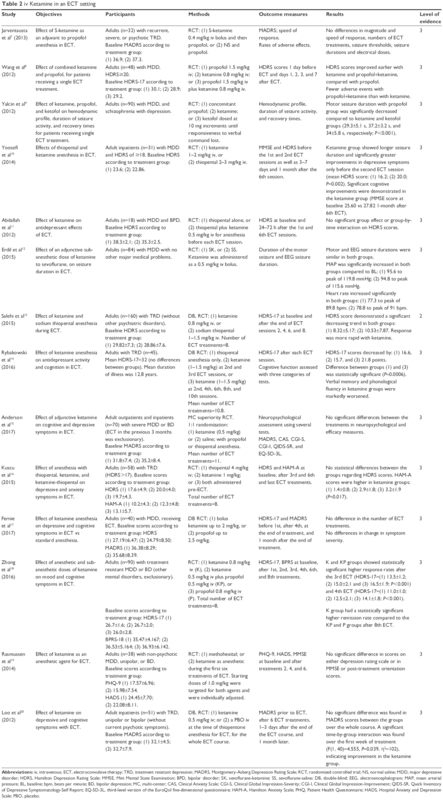 Antidepressant drug effects and depression severity: a patient-level meta-analysis. JAMA. 2010;303(1):47–53.